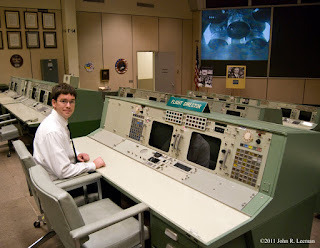 Yesterday I was fortunate enough to go through the mission control facilities here at Johnson Space Center. There is historic mission control from the Apollo and early shuttle days, space shuttle control, ISS control, a training/overflow room, and back rooms. I'm going to share some pictures with you and summarize the setup of mission control and operations. 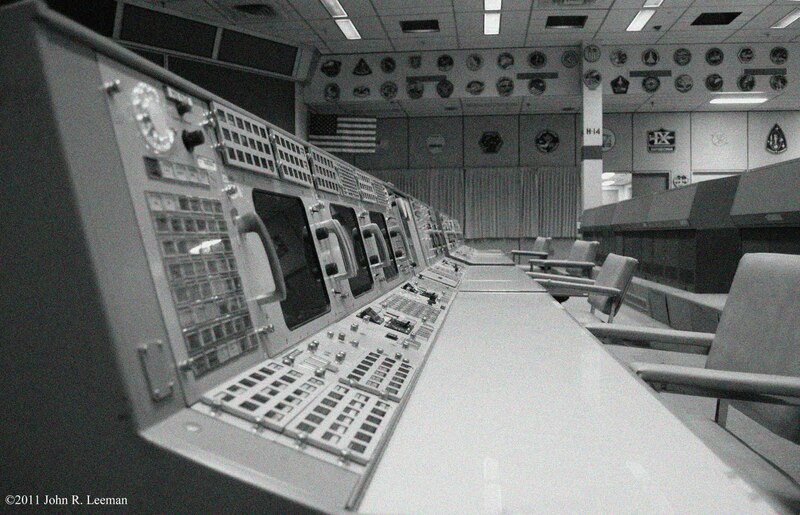 First we were in historic mission control. This is the famous room seen in the photos of the Apollo 11 landing and made even more well known by the movie 'Apollo 13'. The room is relatively small with a visitor viewing gallery. Each station or console was responsible for a system or set of systems such as guidance, navigation, control, CAPCOM (capsule communicator), etc. Every console has a set of loop buttons. These loops can be thought of as conversations. Say the thermal guys need to talk to attitude control (ADCO) and maneuver the spacecraft so it can cool or heat properly. They would punch up a loop and start talking. Controllers listen to many loops simultaneously, but only talk on one at a time. Eventually all decisions are at the discretion of the flight controller. When a decision is made the CAPCOM (the only person who actually talks to the spacecraft) relays the message. A little known fact is that those controllers in the 'front room' are not the only personell working on the mission control day to day. There are many 'back rooms' surrounding the control center in which more systems specialists look at various sub-systems and aspects of operation. They report to the front room system manager who then reports to flight control. This design of control is still used today. In addition to subsystem back rooms there are also people like geologists in back rooms that would request astronauts look at certain areas/rocks when on the moon. Shuttle mission control is now sadly quiet after the recent retirement of the space shuttle after a great 30 year run. I've posted pictures of the shuttle control room before, so I'll save the space here and move onto the International Space Station (ISS) control room. The ISS control room is similar to shuttle control with one major exception. The ISS is flown from the ground. 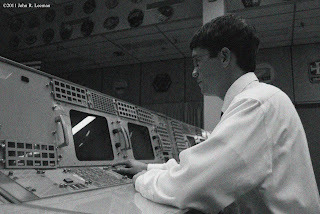 With the shuttle and Apollo astronauts actually flipped switches and punched up computer programs to fly the vehicle. The ISS astronauts are free to work knowing that their orbit is controlled by the ground. The orbit of the ISS is occasionally boosted to combat continual orbital decay. The orientation of the station is also changed for thermal, scientific, and debris avoidance. Much of the maneuvering is done by speeding up, slowing down, and rotating giant gyroscopes on the station. These moves require no propellant, but there are technical issues (that's for another time though). There is also a training/overflow control area, but that area is currently undergoing a few remodeling projects. On a side note I was able to fly the shuttle simulator before it is dismantled. We started at 10,000 ft. on landing approach. I came up just short of the runway the first time, but got it on the ground the second time (even if it wasn't a pretty landing). This entry was posted in Space and tagged Mission Control, NASA, Space shuttle. Bookmark the permalink.